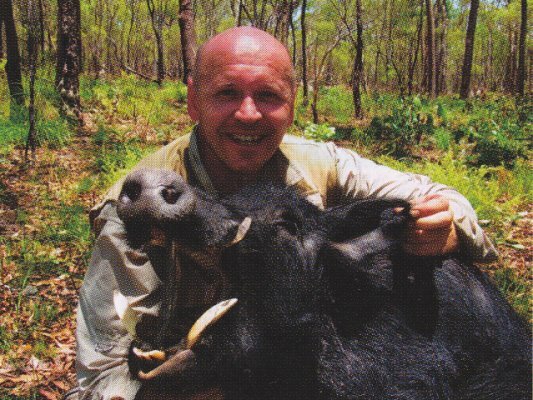 WE�VE HUNTED out of Darwin, in Arnhemland and across the best pig country in NSW, including the once-great Macquarie Marshes. 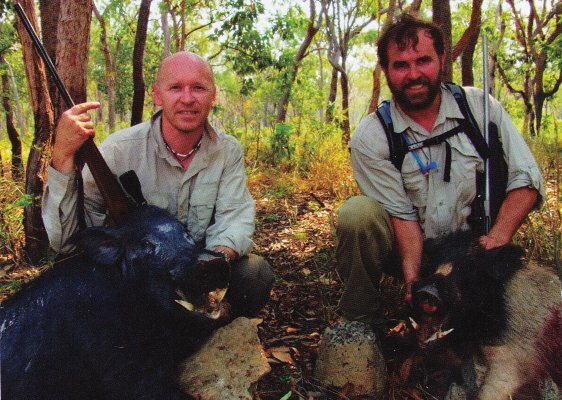 I have secured hundreds of boars of varying sizes and ivory along the way, but our thoughts and dreams always turned to the big tuskers being tagged in Cape York. 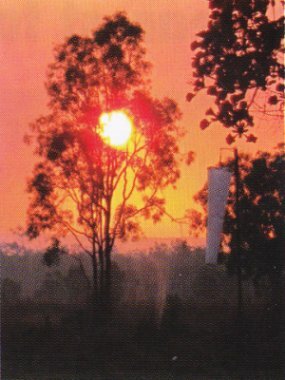 My good mate Ken and I sat on the �Red Eye' out of Sydney to Cairns and got set to take the mail plane to famous Strathburn Station (pig heaven in the heart of Australia's last Frontier). Would the Cape live up to its mighty reputation? We�d know soon enough! Landing on the airstrip in front of Strathburn's homestead, we were greeted heartily by our guide Alisdair (a no-nonsense, great country guy). Within an hour, we were settled and sorted and in the Toyota Troopy heading out seeking �first blood'. We had chosen to hunt late in the season to maximise access to the boars, which we assumed would congregate more on the permanent waterholes as the country went dry by early November. We would soon find out that there was still water strewn right across this place, a function of last year�s usually big wet. We were equipped with all the essentials for survival in the 50km by 50km wilderness; two spare tires, an Sky full of food, cold water to quench our thirst in the heat of the day, a hacksaw to secure any trophy jaws, Alisdair�s trophy billy to brew tea for our snack and lunch breaks, his backpack with a first-aid kit and satellite phone in case of emergency. As we squeaked, rattled and bumped along the bush track, our anticipation of encountering the big tuskers was extreme. Having waited many years for this moment, Ken and I finally were in the Cape. Alisdair soon had us checking out waterholes and a beautiful lily pad covered waterway. I caught two small boars napping on the bank, but we passed them up and waited for something larger. The next stop was a dam with three pigs camped under a tree on the opposite bank. Ken started the stalk with his Tikka .308 using l50gn Core Lokt bullets. Over the week would prove devastating on all pigs big and small, stationary or running. Carrying my Sako .270 together with Remington 150gn pills on board, I held back in position to get a shot off in case the action started a little early. Both Ken and I were so focused on the sleeping pigs that we never saw a big boar come out of the bush and stop right between us. We heard Alisdair�s soon-to-be-familiar whistle advising us of something not quite right. 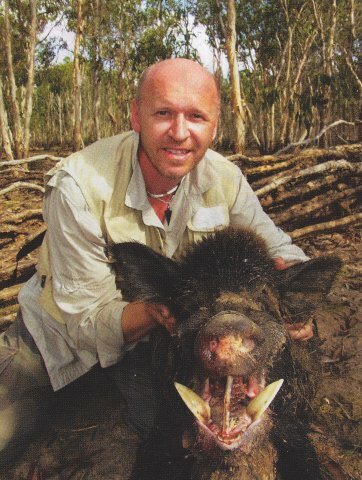 Ken turned and shot the boar through the head from about fifteen metres. What do they say about pigs... when you least expect it! As the day progressed, we moved from one hunting area to another with our eyes peeled for pigs and our necks twisting and turning as we tried to absorb the beauty of the varied landscapes that assaulted our senses. The landscape shifted from dry flat grassy plains to heavily wooded sections, burnt-out lunar landscapes, lush tropical regrowth areas, beautiful lakes and lagoons and then the numerous and scattered termite mounds. Not only is the landscape ever changing, but the wildlife is extraordinary. Brolgos, Jabirus, goannas, eagles, kites, ducks, geese, the beautiful blue-winged kookaburras, scrub bulls, dingoes, brumbies, freshwater crocs and many other fascinating creatures, some that have a bite bigger than their bodies "Those bloody Green Ants". On the third morning, we walked creek after creek with no result, but on the fourth walk, we secured four of the best pigs we�d ever come across. With Ken on one side and me the other, we soon found what we were looking for - a big boar camped-up in the riverbank avoiding the heat of the day. It sprang up only ten metres away. The boar slowed to get an impression of what had disturbed his slumber, but the bullet was already on its path smashing into his upper chest and killing him instantly. The tusks I quickly found were my best set ever. Another eight hundred metres on, we disturbed a mob of fifteen sows that we watched for a while before they slowly trotted off into the bush. Suddenly, a huge black boar launched out of the creek bed just in front of me. I was better prepared this time, but the boar didn�t slow as he rushed into long green grass. I immediately sighted him on the clearing just ahead. 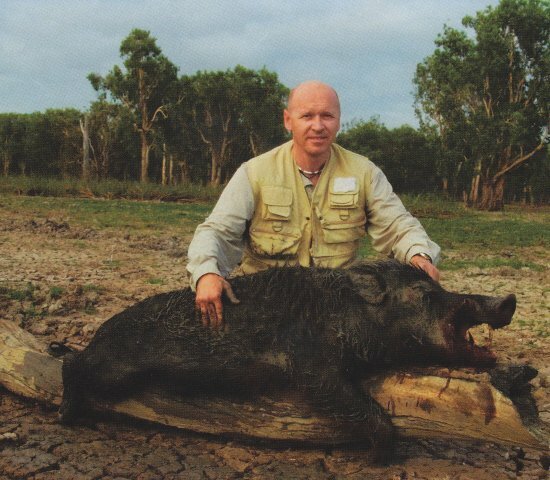 Once he exited his cover, the Remington 150gn entered just above the left front leg and exited through the boar�s head, causing a dramatic tumble. We continued on with a new spring in our steps fuelled by those two close encounters. The next boar jumped up on Ken�s side of the creek. A clearing allowed me to track it in my scope as it headed quickly for cover. I hesitated and waited for Ken to shoot, but heard the distinct click of a misfire. By now the boar was a good eighty metres from Ken, but he composed himself and dropped it on the run. As we walked towards the fallen boar, we could see the white ivory sticking out from its jaw. Ken was drenched with sweat, but the smile said it all. An awesome pair of tusks to go into his collection! As it turned out, most of Ken�s shots that week were all over sixty metres and mostly on the run. His best effort was a large boar that we spooked as Al drove to our lunch spot at a dam. That shot was measured at one hundred and forty metres. Those Remington 150gn Core Lokt projectiles certainly did the business! Nearing the end of the creek, Ken and I were exhausted from the humidity and lacking water that we had left behind. It was early afternoon and the mercury had risen fast. "Let's press on for another five minutes", I suggested to Ken and Alisdair. Not more than one hundred metres, we got lucky again. A boar emerged from under a fallen tree and was very close to cover. To our delight, it made the mistake of running across our path rather than into the scrub. Sometimes I find running shots at these distances easier than stationary targets. Once again a good-sized boar with great tusks was secured. It was a long, long walk back to the Troopy, but an extremely satisfying one. Ken and I loved this as we each had nailed our personal best set of tusks. One afternoon, we interrupted our hunting with some fishing and caught Saratoga, Black Bream and catfish. A local Freshwater croc took a fancy to the catfish splashing at the water�s edge. Then freshly headed straight over, left the water and grabbed it. I videoed the whole thing in amazement! 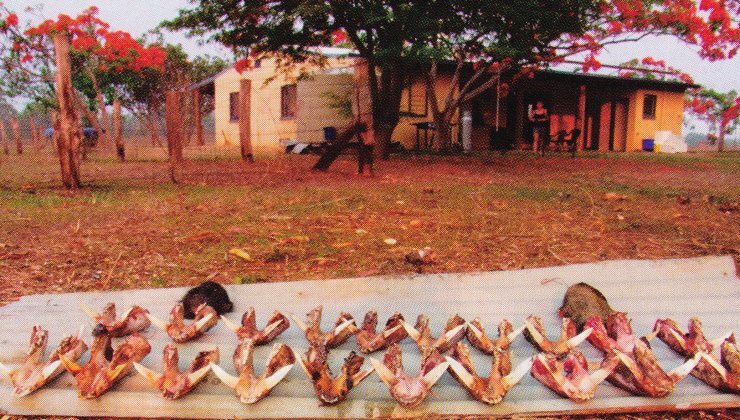 The seven-foot long croc fought with Ken and his fishing rod, as the catfish was still on the line. It wasn't till the line snapped and the swivel exploded into Ken's chest like a whip crack that the tug of war ended. The croc scattered off to enjoy this meal, while Alisdair and I crashed to the ground laughing. After that, Barramundi were hooked, but regrettably none of them landed. We hunted a swampy watercourse surrounded by overhanging trees where you�d almost expect pigs to be, but after an hour we emerged with not a sign or sighting of a pig. We then headed over a small ridge that exposed us to an open dry area for about one kilometre. Suddenly, a small but crusty old warrior sprung into action only fifteen metres in front of me. 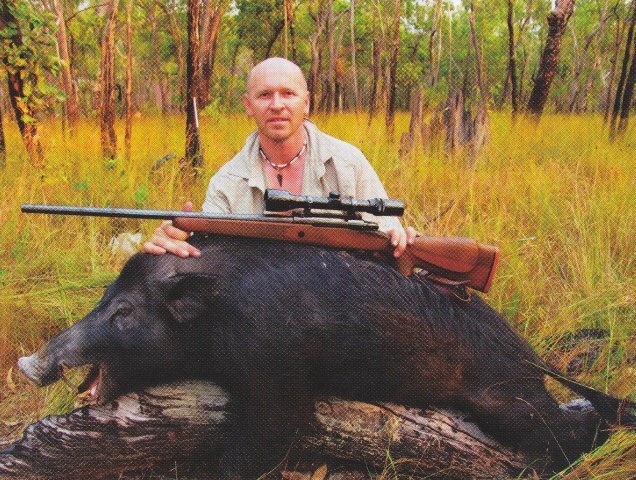 Once again, the crack of the .270 shattered both the silence and a boar�s day. 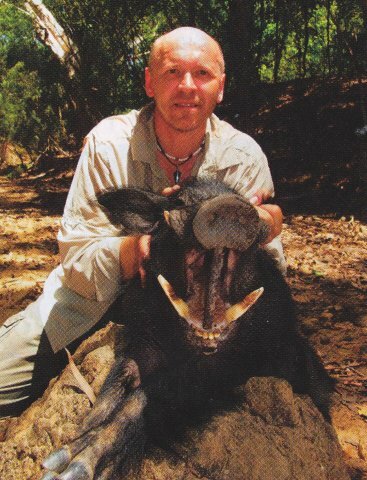 The ancient 60kg porker with great long white tusks had been secured at a spot a pig wouldn�t be expected. Another one for the old rule; "expect pigs when you don�t expect them". 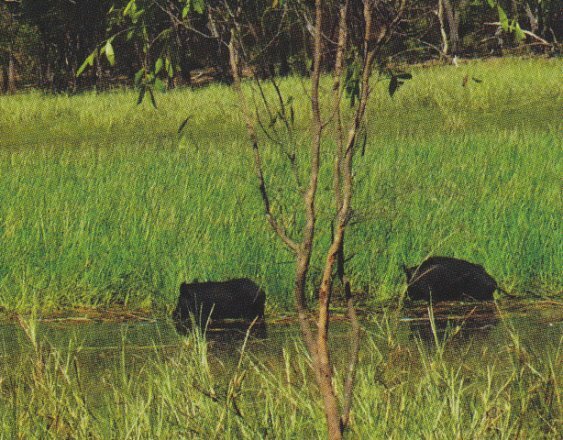 Boars throughout the week were taken sleeping in sandy hollows within dry creek and river beds, around water holes and lagoons, oil carcasses, dams, and paperbark swamps. On one occasion, we started a stalk onto a dam through paperbark trees, when pigs were sighted in the swamp beyond the dam. As soon as they left, I set up my rifle against a tree and watched the original mob of pigs wallowing and playing at the water�s edge. A large boar with distinctly thick ivory entered the scope and pushed his way past sows and other pigs showing them who was boss. My crosshairs immediately centred on his vital area. The gun shattered the silence and as the pleasing thud of the bullet echoed back to me, I was already recycling the bolt and let loose on the other beasts. While the boar thrashed his last kicks in the water, many more pigs emerged from unsighted hidden wallows and they scurried to the top of the dam wall, not knowing where the shot had come from. By now, another bullet was on its way dropping two pigs with one shot. The commotion sent all the pigs heading for the bush, but a young boar exposed himself on the dam wall, which was his last mistake. Our tally for the week was 38 pigs. The Cape had delivered up all its beauty and splendour, providing us with an amazing experience and life-long memories. Alisdair proved to be a champion guide and top bloke. 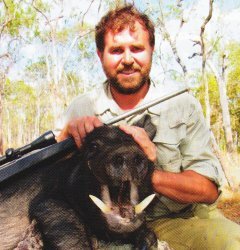 Strathburn produced quality tuskers aplenty, arguably the best in Australia and we have already started making plans for next year! Call Rory 0414 703 471 or www.stathburn.com for more info.